You’ve been adding honey and whiskey to your tea since your grandma told you it could cure a cough. It’s time to take your tea and whiskey game to the next level just in time for St. Patrick’s Day. Get there with this Irish whiskey inspired cocktail. I’ve been a fan of The Copywriter, and thankful to its creator Steven Weiss of Craftbar in NYC, since I stumbled across this refreshing little gem. After all, this tasty concoction is an easy-drinking blend of Irish whiskey, lemon, and honey syrup. What more could you ask for in a drink? This flavor profile is just begging for one more Irish addition. Since you can almost never go wrong with a standard like Irish breakfast tea, and you’re making a honey syrup anyway, may as well go for the gusto. This edited version has everything you could want in a whiskey cocktail. 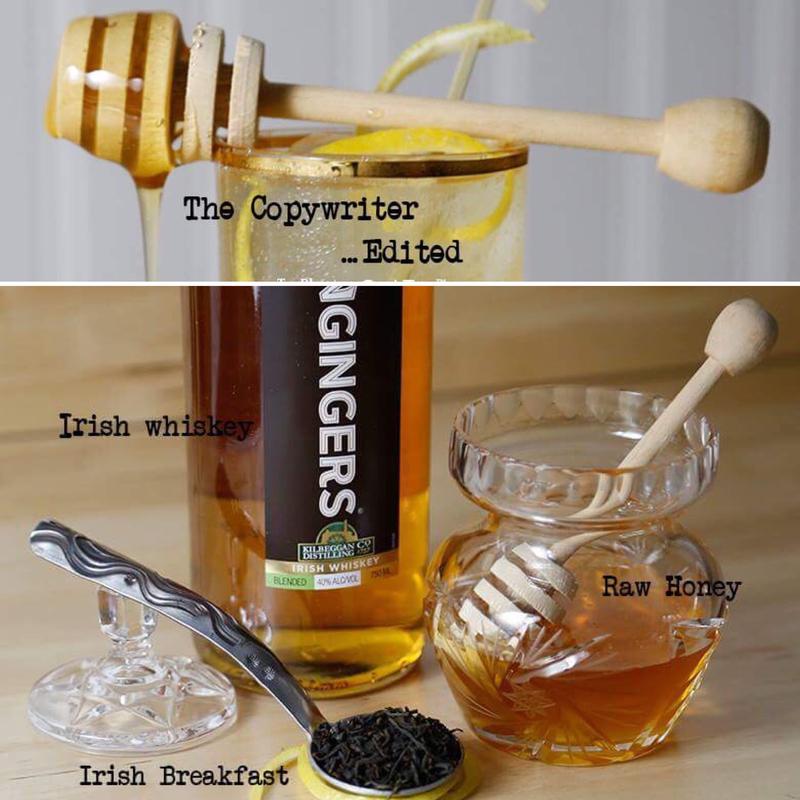 For each cocktail add whiskey, lemon juice, sweet vermouth, and honeyed tea syrup to a cocktail shaker filled with ice. Shake and strain into an ice-filled Collins glass. Top with seltzer. Garnish with a lemon twist. Bring water to a boil. Steep tea for 2-3 minutes. Mix 1/2 cup hot, brewed tea with honey. Combine well. Chill. You’ll be singing Danny Boy in no time. We understand, it’s early spring and the last of the winter doldrums are still lingering. You’ve lost enthusiasm for your New Year’s resolution to get healthy but you realize swim suit season is still right around the corner. You need something to boost your metabolism and your spirits. We have just the thing. Enjoy Tea Phactory’s Yerba Maté Double Berry Booster which starts off with yerba maté, well known for providing a smooth increase in energy, and combines it with the metabolism-enhancing punch of goji and maqui berries. This powerful brew, with delicious berry notes, is made slightly sweet with the addition of stevia. We recommend enjoying at least two cups a day to get the full energy enhancing and metabolism boosting benefits. Replace your morning coffee or tea routine to get your day started right and repeat the ritual in the afternoon for the perfect pick-me-up. Heat 16oz fresh, cold water to a boil then cool to 160°F. 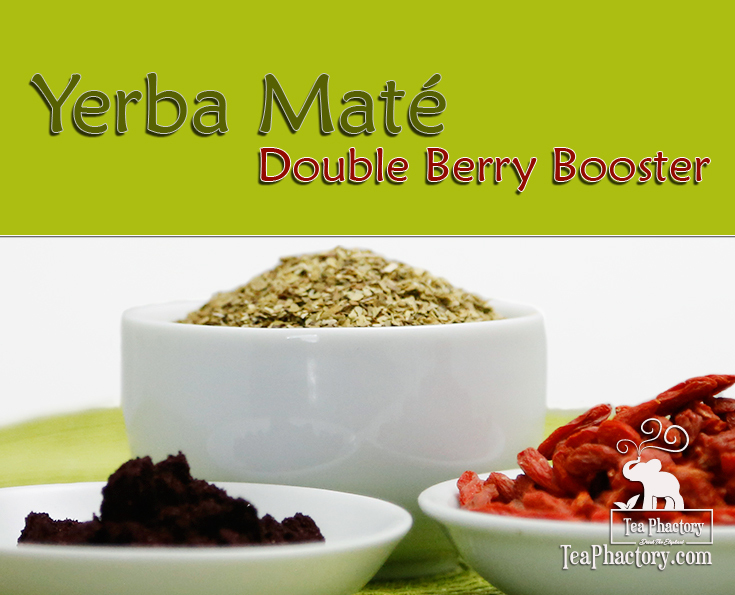 Place yerba mate, stevia leaf, dried goji berries, and maqui berry powder into infuser basket. Steep 5 minutes, strain. Tip: Take care not to use boiling water and always remove leaves from water to prevent the brew from becoming bitter. Tea Phactory’s high quality Yerba Maté is made from the dried leaves of the evergreen holly Ilex paraguariensis. It offers the health benefits of tea while providing the kick of coffee without the irritating jitters. It boasts a clean, calm energy and promotes a state of alertness. Maqui berries are small, dark purple berries grown on evergreen shrubs in southern Chile’s Patagonia region. This ancient, antioxidant-filled berry was used for centuries by Mapuche Indian warriors to improve strength and stamina. The slightly tart flavor offers hints of blackberry and pomegranate. Summer is officially here and strawberries are in season. This refreshing iced tea is sure to be a thirst-quenching winner at your summer picnics and barbecues. Place strawberries in a bowl with sugar and set aside, stirring occasionally. Juice lemons for ¼ cup juice, set aside. Place loose leaf tea, stevia and lemon zest into your tea pitcher. Bring 3 cups water just to boiling, about 208° Fahrenheit. Pour hot water into your tea pitcher. Steep tea for 4 minutes. Allow to cool for 5 minutes then add 2 ¾ cups of cold water. Add lemon juice, stir and chill in refrigerator for 30 minutes or pour over ice. Put a generous spoonful of strawberries into a glass – be sure to add some of the yummy syrup. 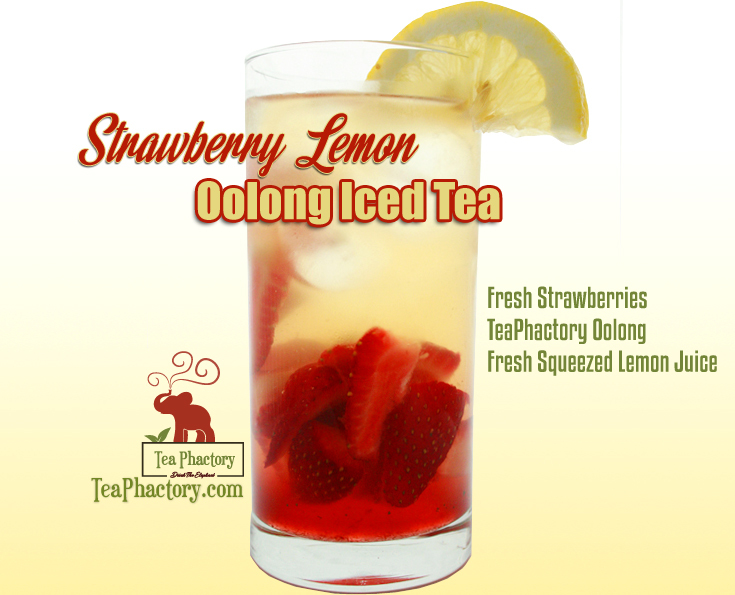 Using a strainer, pour tea over ice and enjoy! Splendiferous Rooibos Tea is a healthy blend of organic green rooibos, hibiscus petals, elderberries and peppermint for a burst of fruit flavor with a hint of cool mint. Yogurt is a great source of calcium and phosphorus, especially good for the bones of growing children. Yogurt is an amazing food that is high in protein, and Greek style yogurt has about double the protein of regular yogurt and is high in probiotics. Good quality live bacteria yogurts are beneficial to your digestive tract. 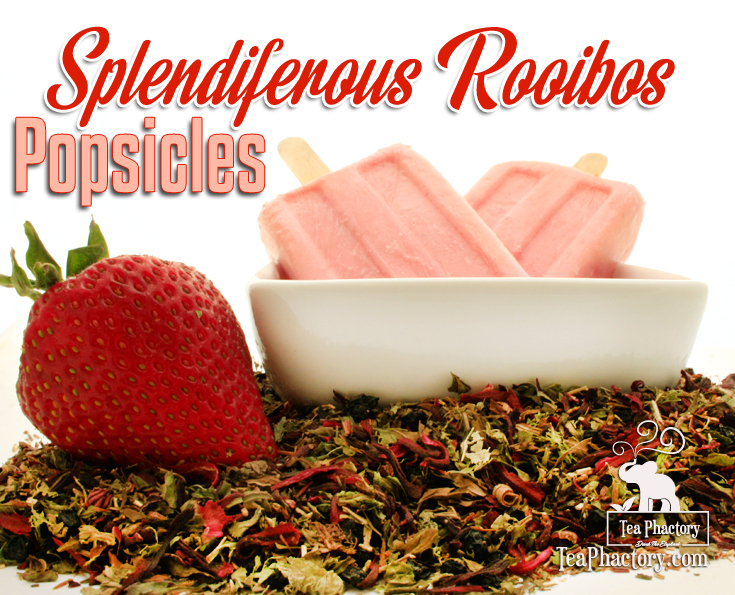 These popsicles are a delicious healthy snack that you can feel good serving to your family. Steep the Splendiferous Rooibos Tea in the 2 cups of hot water for 5 minutes. Strain tea and pour into blender. Add honey or Agave, strawberries and yogurt. Pour into popsicle molds and freeze until hard, overnight is best. There is nothing better than homemade popsicles when summer weather hits! Making popsicles at home saves money and allows you to be creative and use healthy ingredients like tea, yogurt and fruit. 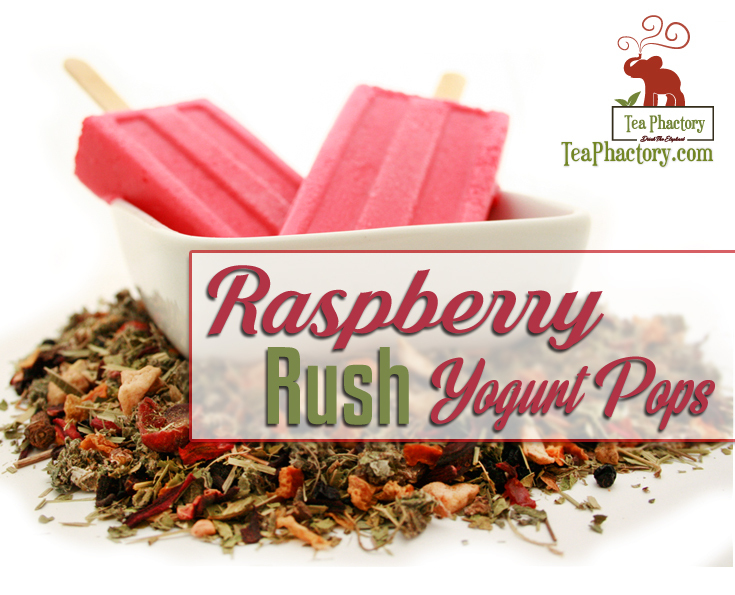 Kids enjoy helping out in the kitchen and eating the fruits of their own labor with this simple recipe for healthy Raspberry Rush Yogurt Pops. Steep Raspberry Rush in 1 cup of hot water for 5 minutes. Pour tea into blender, add gelatin and blend until well combined. Blend in banana and yogurt until smooth. Pour mixture into molds and freeze until hard (overnight is best). A great bonus of this healthy popsicle recipe is that they are dripless! Make up a bunch and beat the summer heat. Temperatures here in my small town reached the low 80’s today. I spent a good part of the morning cleaning up my front yard (just call me the weed-inator). Glad to have that big job out of the way. Whew! When I finished all my yard work I really wanted a refreshing drink. I needed a tall, cool glass of iced tea, so I decided to brew up our new Signature Blend, Splendiferous Rooibos (say that 10 times fast). Anyway, I steeped Splendiferous at double strength and poured the brew into a pitcher and put it in the fridge for about 30 minutes to chill. Then I poured the beautiful deep burgundy tea into a tall glass of ice and added a splash of lemon. I love it just because it’s so pretty! The delicious berry flavor with a hint of cool mint really hit the spot. 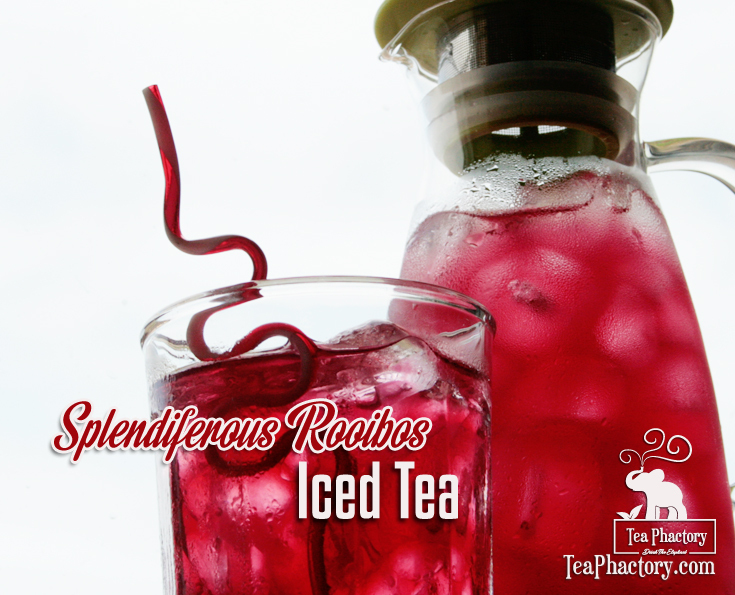 I’m smiling now, knowing that I can quench my thirst with a healthy rooibos iced tea instead of a soda. Bring on the summer! 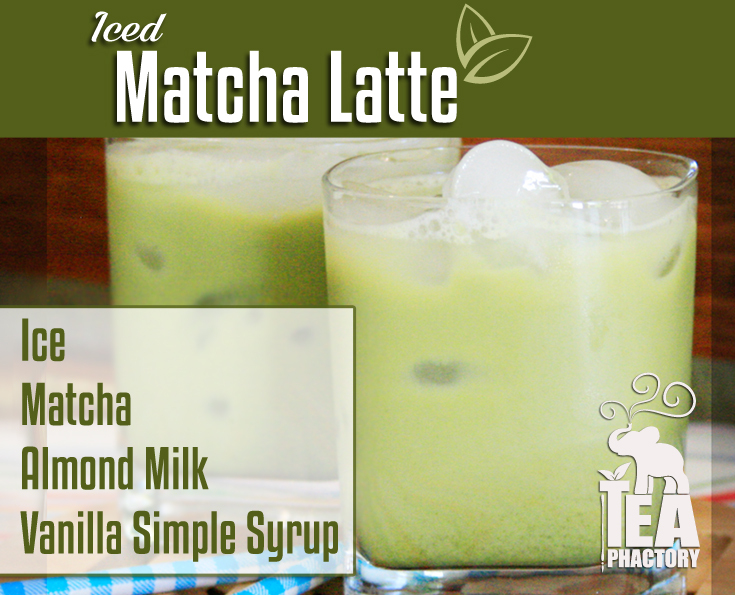 Blend up this Matcha smoothie for a healthy way to get your morning started right. 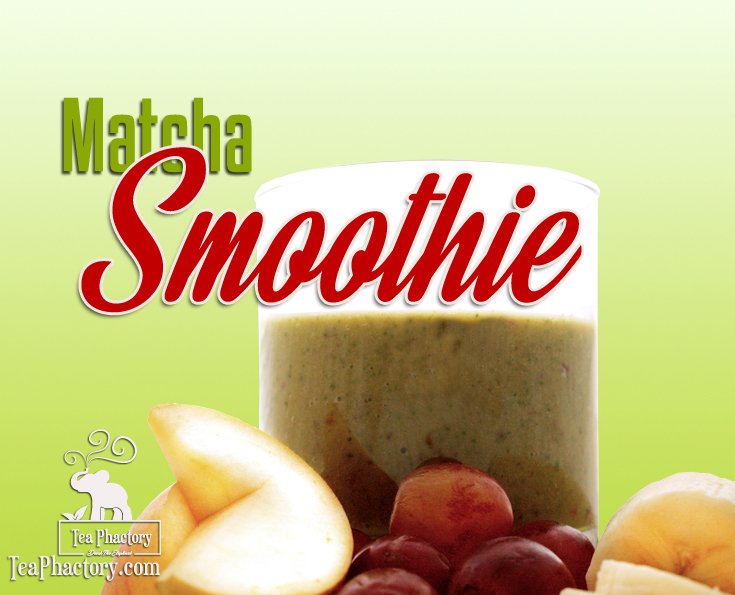 You get protein, vegetables, fruit, and the energizing properties of Matcha green tea, all packed into one delicious smoothie to keep you going throughout your busy morning. Blend on high for 60 seconds or until desired consistency. 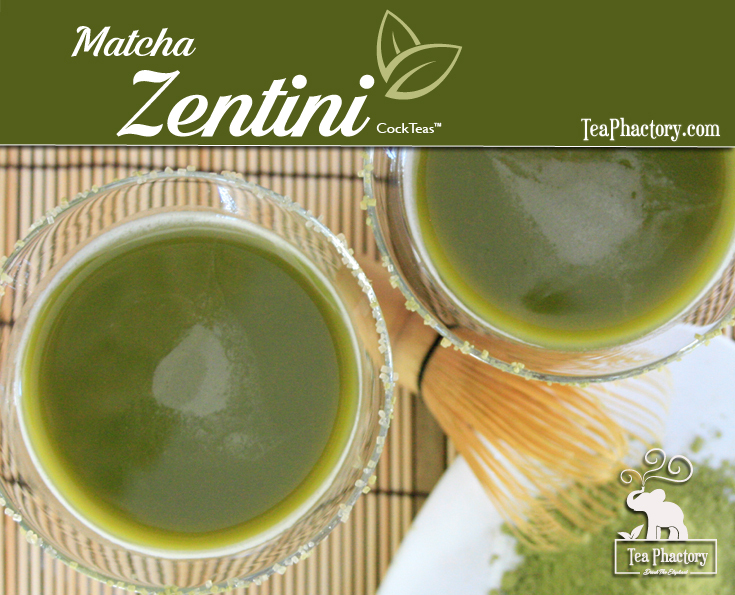 You can also use Matcha powder in a variety of food recipes, ranging from ice cream to soup.